At its simplest, Front End List Magic can add animated pagination to just about any list, from the image lists that make up a gallery to the text based lists of a page list. Add a Front End List Magic block next to a list or gallery thumbnail and Front End List Magic attaches itself to a list and paginates it. But Front End List Magic can do so much more than that. Select the front end editing options and you can make page, file and image lists show what you want, not what the lister gives you. 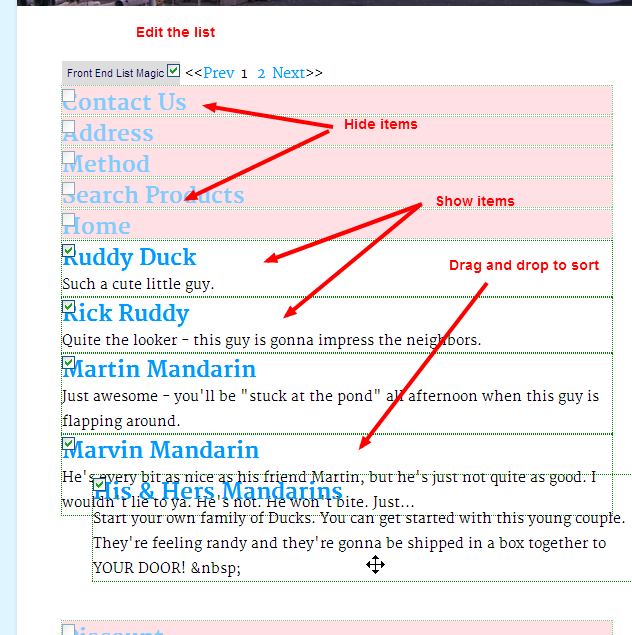 From the page you can sort the list by drag and drop and show/hide items simply by clicking a checkbox. See the getting started section in the documentation. The original list remains unchanged. All you are editing is how the list is viewed by other users on that page. Add animated transitions to paginated lists. Sort and select a page list or file list to show exactly what you want in the order you want it. 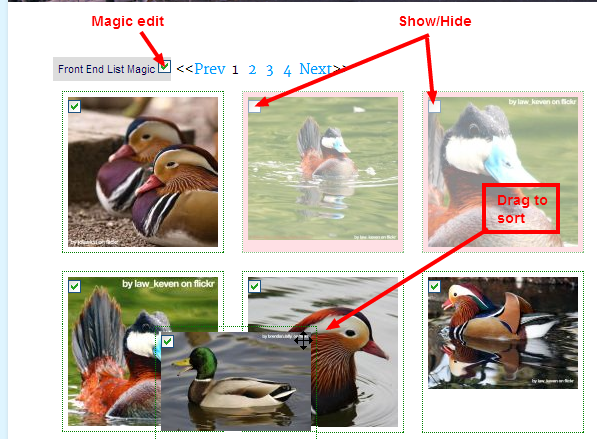 Partner Front End List Magic with Front End File Uploader to manage an image gallery from the front end. Front End List Magic defaults to simple selection by adjacency in the page, such as ‘Next Element’. In most cases the default options will be all you need. Add a Front End List Magic block before a list block and it will find the list and provide controls to sort and select the list from the viewed page. Advanced options enable list selection and configuration by jQuery selectors and html element attributes for lists that can't be located automatically (see documentation for details). What lists will it work with? Users that don’t have access simply see the sorted list. You can even have multiple Front End List Magic bocks on the same page, each set up for a different user and placed next to a different list. Each user will only see their own edit controls. The prompt to edit, what edit controls are available and pagination are all configurable. If the list changes within concrete5 after it has been edited by Front End List Magic, you can select whether the new list items go at the start or end of the list and whether they are initially shown or hidden. Important: While Front End List Magic is the ideal companion and does cool stuff with many list or gallery blocks, Front End List Magic DOES NOT include a list block. > The above gallery is achieved by a Simple Image Gallery block showing all the images in my banner set. Normally this would have shown a list of ...... more.